All of this even the most futuristic office space full of bean bag chairs, fruit bowls and ping pong tables would have a hard time competing against. But think again. The tourism industry gets people for the few weeks per year when they are on vacation. Even in the countries with the most generous vacation time that’s not more than 6 weeks per year. Recruitment is about selling people on what they will do for the other 46 to 50 weeks of the year. And just like the travel industry, they are facing an audience of millennials that are becoming pickier and pickier. So, what can recruiters learn from the emerging trends in the travel industry when it comes to attracting the Generation Y? Think of your company as the ‘dream destination’ that should be promoted to a ‘millennial client’ – the recruiter is their travel agent. In this small series, we list some of the major trends in tourism and what your company can learn from them for its recruitment. In order to get to these new travellers (read: candidates), we first need to know a bit about their behaviour. What does a Millennial traveller and candidate look like? 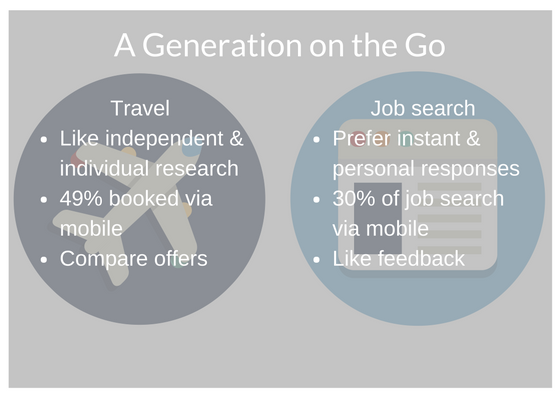 It’s worth noting that Millennials and traditional tour operators or travel agents are not an easy match, for a simple reason: Millennials love to research everything independently – Speed and online presence are essential to Gen Y travellers. They want to know everything, they want to know it now and they will 49% of the time use their mobile devices to book their trips. When they want to book their flight and your website has a too slow response time, they will just leave. They also expect instant confirmations and the possibility to store any booking or ticket on their mobile device. Companies such as Skyscanner, Momondo, Expedia etc. have found a way to provide travel information faster and make it comparable. The perfect fit for this generation on the go. Yes, job portals matter (which shouldn’t come as much of a surprise you as you are reading this on Graduateland). But that’s not the only or even most important conclusion. The main point is: Make your communication with potential candidates and applicants as easily accessible and readily available as possible. This can be via live chats, specific apps, notifications or active social media channels. Think of ways that let you contact your applicants instantly. E.g. As soon as a candidate has applied send them a confirmation ticket that can be stored on their mobile device. The same if you invite them for a job interview. Provide a ticket with the name of the recruiter, time of the interview and the address. Also, Gen Y applicants are particularly hungry for feedback – so let them know what they can do better even if you don’t hire them. Also, make sure your career pages are optimised for mobile use. On Graduateland alone, 30% of the users view job ads via their smartphones and tablets! That means cutting down on job descriptions in PDF format (they are impossible to read on small screens).